Most Important Brake Development in 43 Years - Now for the first time on a U.S. car, caliper disc brakes for faster, safer, straight line stops. Won't fade. Are unaffected by water. Not since the introduction of 4-wheel hydraulic brakes has there been a major improvement in brakes for an American passenger car. Now Studebaker Corporation introduces power-assisted caliper disc brakes. . . standard for '63 on the Avanti and a low cost option on all Larks, the Cruiser and the Hawk. And disc brake performance is dramatically superior. Even on the record-breaking Avanti, disc brakes stop the car in 150 feet less distance than conventional drum brakes – from 100 miles an hour. Studebaker cars are the first with brakepower that keeps pace with horsepower. Disc brakes have no fade and in heavy rain or puddles, the caliper pads sweep the discs clear to maintain stopping power. Whatever the weather, they give you straight-line stops in amazingly short distance – time after time. Safer stops! You'll want to understand what disc brakes can mean to you. 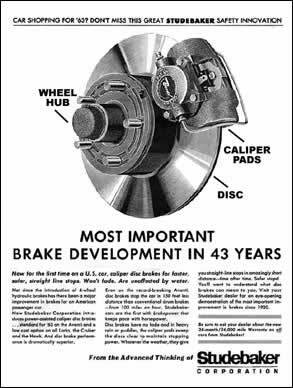 Visit your Studebaker dealer for an eye-opening demonstration of the most important improvement in brakes since 1920.